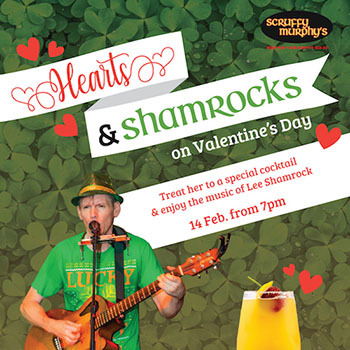 While many couples celebrate their love on Valentine’s Day, Scruffy Murphy’s this year is welcoming singles to toast Cupid’s day with a special cocktail, Free BBQ and live music from 7 p.m.
Don’t be sad if you are unattached on Valentine’s Day. Celebrate with us! Who know? You might find your soulmate down the Irish pub on Sukhumvit 23. Our mixologist has created a unique cocktail – the Strawberry Passion Fruit Kiss – with a gin base for only 170 net and it’s available only this Feb. 14th. Moreover, “human jukebox” Lee Shamrock brings his guitar and harmonica to Scruffy’s to make you laugh and sing the night away from 7 PM onward. Moreover, we have merged the Valentine’s Special to our BBQ Thursday. We offer free BBQ with a drink purchase from 7 PM onward. Please join us for a delightful evening of delectable food, fruity cocktails, unique music and a chance to meet your soulmate. Scruffy Murphy’s is an Irish Pub in Bangkok located on Sukhumvit Soi 23. The venue offers Irish food, Guinness and a variety of other beers, and there are large TV sets showing sports events. Scruffy Murphy’s offer numerous of promotion during the week such as half price chicken wings on Monday, pie night on Tuesday, 50% off bar snacks on Wednesday, free BBQ on Thursday, and Live music by Strummcz from 8:30 to 10 :30 PM plus Fish n’ Chips special price every Friday.